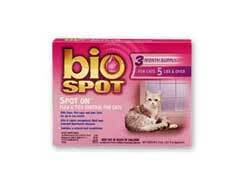 Bio Spot for Cats - Best Cat Flea Remedy for a Buck! Bio Spot for Cats – Best Cat Flea Remedy for a Buck! Bio Spot for cats is one of the most commonly used flea treatments for felines, and the low cost is one reason why this medication is so popular. This treatment lasts for a month, is easy to apply because it is a topical medication, and is very effective. The cost of Bio Spot vs. Frontline is significant, and many pet owners will get the same results from either treatment. Bio Spot for cats will eliminate fleas, ticks, and even mosquitoes, and the second medication prevents any eggs from hatching in the environment or on your pet. Because two medications are combined the effectiveness of this treatment is increased. Frontline for cats is also effective, but this medication costs much more than Biospot. Some fleas have developed a resistance to Frontline, and this has not been documented with Bio Spot for cats so far. The medication is easy to apply – you simply place the applicator on the skin of your cat between the shoulder blades and then empty the container. No pesticide should ever be used on pregnant cats with fleas unless this treatment is given on the advice of your vet, because these medications may affect the unborn kittens and possibly cause birth defects. While there are some side effects possible with Bio Spot for cats this treatment is viewed as generally safe for most pets. In some cases there have been reports of skin sensitivity after this treatment has been used, but this is also true of most other treatments for flea control as well. While a cat fleas home remedy may provide some relief these treatments are usually not completely effective. Bio Spot can help your pet become flea and tick flea, and stop any infestation quickly, for a very affordable price. Why pay more for the same results? With Bio Spot you do not have to.